Inspired by a phenomenon in classical mechanics. 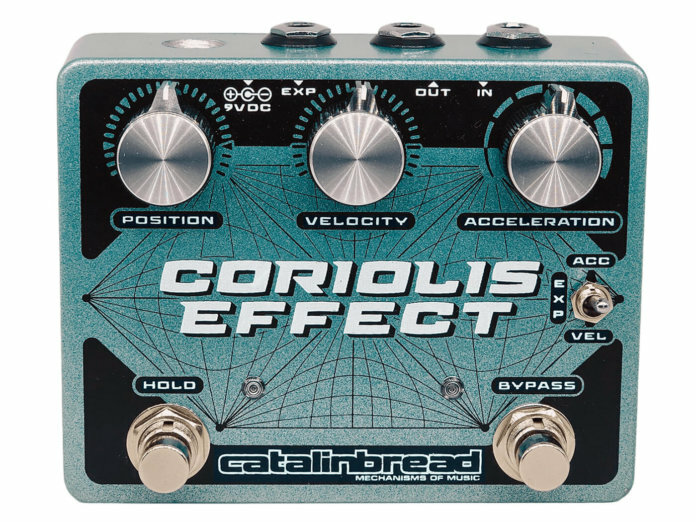 Catalinbread has launched the Coriolis Effect, a multi-talented device that’s packed with a sustainer, wah, filter, pitch shifter and harmoniser. The pedal’s namesake, the Coriolis Effect, is described as a “phenomenon in classical mechanics where a trajectory becomes altered due to a rotating frame of reference”, according to Catalinbread. Turning down both Velocity and Acceleration parameters at once lowers the pitch and cuts the high frequencies, giving you a sound that the brand describes as playing “in the heart of a black hole”. Apart from these parameters, the pedal also features a Hold switch, which halts new sampling and loops the current signal. Activate it during a chord for a sustain of up to two minutes, or mid-melody for a fast stutter/delay effect. Otherwise, the pedal has an expression pedal input, internal bypass mode switch, internal trimmer pot (gain control) and internal expression pedal polarity switch. Retails at $229.99. More information at catalinbread.com.